An idea that took root in a nursing home in Belgium and developed into a smart system that allows the housebound to cycle the world has just won the very first AAL Smart Ageing Challenge Prize – and a cheque for €50,000. Jan and Roel Smolders of Activ84Health Explorer picked up the major European award at a glittering ceremony held at the AAL Forum 2016 in St Gallen, Switzerland, a long way from Witte Meren, the nursing home Jan runs in Belgium and where the idea was born. They are now looking to take the product into nursing homes around Europe. The idea emerged when Jan was looking for a way to keep his residents physically active in a safe, motivational and fun environment. Teaming up with his brother Roel, a health technology expert at the Flemish Institute of Technological Research at the time, the two brothers went on to develop the technology that offers older people who can no longer get out and about a window on the world. Called the Activ84Health Explorer, the smart system allows users to freely explore towns and countryside while cycling on a stationary bike from the comfort of their own home. Autonomy and the stimulation of memories are two of the core values that drive this innovative start-up company to provide physical and cognitive wellbeing for its users. Using Google Streetview connected to a bike, cloud-based software and touch screen controls, the Activ84Health Explorer was designed to allow older people, unable to get about as they once could, to explore familiar areas from their past. As well as stimulating memories, this activity also prompts social interaction in the home, while at the same time providing a valuable exercise routine. Each user has an individual profile, which allows the platform to take into account personal physical and cognitive abilities. Now the company, which began life as an AAL project and has been on what Roel describes as an “unexpected journey” is on the verge of international exposure having won this prestigious award that was initiated to find the most promising product that uses the internet of things (IoT) to enable older people to live more active, fulfilling lives. With close to 200 entries for the prize, which was run by the AAL Programme, Activ84Health beat off stiff competition, eventually being selected from the final five, who all attended the Forum. “Just being in the top five was incredible,” says Roel. “I am now completely overwhelmed and a little tearful. It has been fun, but I was nervous today. As a start-up company, the money will, of course, be a valuable prize as the business seeks to expand throughout Europe. “We already have distributors in Belgium and the Netherlands, but the exposure we get from winning the Smart Ageing Prize will certainly rocket launch us to reach many new opportunities and business partners across Europe,” says Roel. As well as providing a novel and engaging means for older people to keep fit in the home environment, the Activ84Health Explorer also has applications for healthcare professionals, who can use the collected data to monitor the health and well-being of the older person. The high quality of close to 200 entrants for the AAL’s first ever Smart Ageing Challenge Prize is concrete evidence that not only is the IoT is revolutionising the way we live, but it also has the potential to significantly enhance the lives of older people. It’s a huge area for growth. With a rapidly-rising ageing population, which will see a third of all Europeans over 65 within 40 years, society is now facing huge challenges as well as huge opportunities. Not only can IoT offer solutions to help older people live more active lives at home for longer and remain connected to society, older people are more and more willing to embrace this technology and use the solutions technology provides. 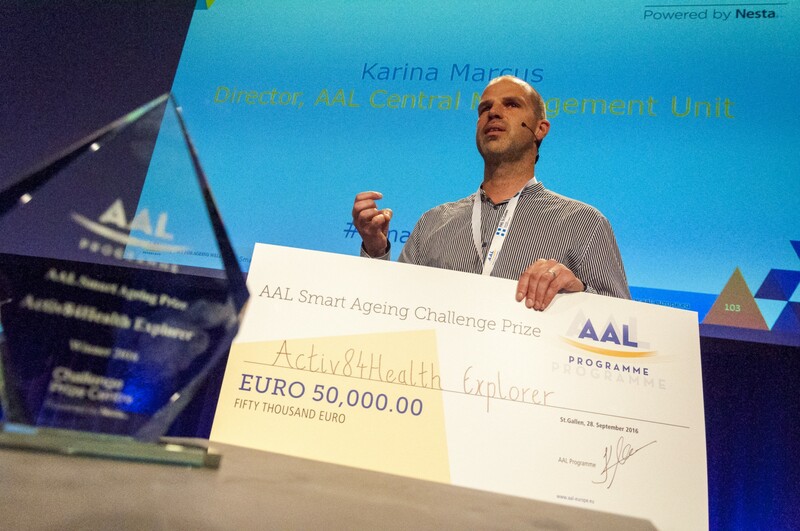 It was with these opportunities in mind, that the AAL Programme — an EU-funded research programme dedicated to supporting research on innovative ICT-enhanced services for ageing — launched the Smart Ageing Challenge Prize. Karina Marcus, AAL’s CMU Director says: “Our very committed jury assessed many extremely interesting ideas and selected 15 amazing finalists. These were then shortlisted to five and we are very excited to have been able to announce the final winner – an IoT solution with real potential.